In the present study, Ichthyophonus hoferi infection determined from some internal organs of goldfish, Carassius auratus L., 1758 were examined. 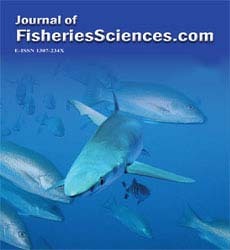 Pathogen was detected in the fish C. au-ratus that were examined in order to investigate the causes of sporadic deaths seen at a private aquarium. According to spherical shaped and multinucleated morphological features sur-rounded by a thick fibrous membrane at average of 200-250 ÃÂ¼m in diameter seen in squash preparations made from heart, liver, spleen and kidney, agent was described as Ichthyophonus hoferi. The developmental stages concerning granuloma formation created by the host against pathogen I. hoferi were described on pictures in detail.